Home-grown Tofino tomatoes. In June! And I thought I was an ace at growing tomatoes in chilly Tofino. Yesterday, Merry Bewick down on Chestermans Beach called me up and asked if I would come over and sign a copy of one of my books, that she had purchased as a gift. I’ve been carefully tending my tomato seedlings since March. I’ve done a great job, I must say – some are approaching a foot in height, and a few even have buds on them. 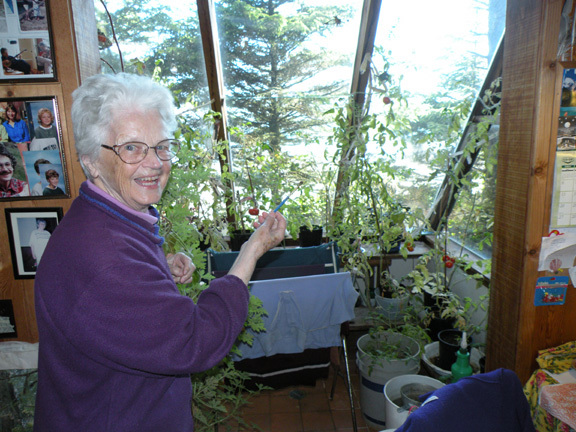 So imagine my surprise when I saw Merry with a window-full of full-size tomato plants, many of them laden with fruit! The challenge growing tomatoes here in Tofino is that we are on a skinny peninsula, surrounded by the North Pacific. Although we get a good deal of sun most summers, we just don’t get the heat that you need to ripen tomatoes. The plants grow; they even look great. And you can usually manage to get some hard little green tomatoes by September. But to get them to ripen before the winter starts to set in again (usually the second week of October; we don’t have fall), you really have to grow the fastest-ripening varieties. I have had the best luck with cherries: Tumbler and Golden Nugget. In the full-size varieties, Early Girl, Early Cascade and Alicante work best. 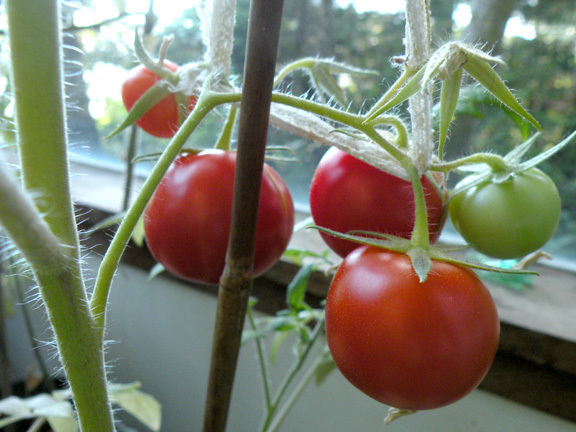 June tomatoes, I thought… no bugs around in winter, when they’re blooming. “Did you pollinate them yourself?” I asked. Merry said that some of the tomatoes were plants that she seeded about a year ago, and others she had grown from cuttings. “I just lop the tops off and thrown them in there,” she said, pointing to a bucket on the floor. Well, you just keep on learning, don’t you? I am surprised that the tomatoes continued to grow through the short days of winter. But then again, I kept a green pepper plant alive and growing at a south-facing window a few winters ago, using a Q-tip as my bee, and getting some early spring green peppers too. I think the secret is two-fold: lots of light, and also that the plants don’t chill down at night, as they would in a greenhouse. Thanks for the tips, Merry! And especially thanks for the tomato, which I enjoyed with my fresh home-grown Port Alberni lettuce (transported that same day from Port by bike!) in an extremely tasty and environmentally-friendly salad last night. It’s so nice to see people becoming more aware of the environment around them. Home grown food is the way to go.